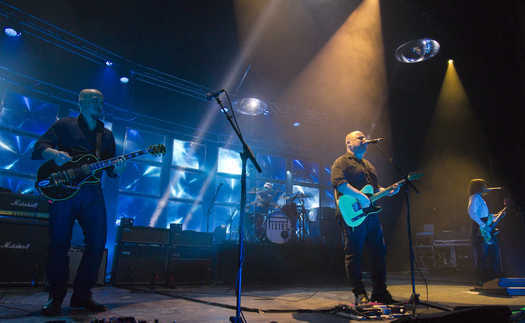 For the first time in more than 20 years, the Pixies rolled into town in support of new material. The influential college rock quartet has now been around longer as a reunion act than in their initial stint. Reunited contemporaries like Dinosaur Jr. have released multiple new albums, making the paucity of new Pixies material – two songs – even more glaring. That changed late last year when lead singer/songwriter Black Francis dropped four new songs on an EP and followed it up with four more last month. All but one of those songs were played when the band performed at the Midland Theater on Tuesday night. Toss in the single “Bagboy” and the as-yet unrecorded “Silver Snail” and new material comprised nearly a third of the band’s setlist. The new recordings received a mix reception online, but for the most part they worked in concert. The appropriately noisy “What Goes Boom” blended seamlessly with the band’s cover of the Jesus and Mary Chain’s “Head On.” Later, in a quieter moment, Francis segued from “In Heaven (Lady in Radiator)” to “Andro Queen.” The songs were recorded 26 years apart, but sounded onstage like they were pulled from the same session. “Bone Machine” announced the band’s presence, and although the thumping bassline that introduced the song was familiar the musician wasn’t. Paz Lenchantin, a veteran of A Perfect Circle and Billy Corgan’s Zwan, filled the gaping hole left when founding member Kim Deal departed last June. Lenchantin didn’t have any problems replicating Deal’s basslines, but her thin voice was often buried in the mix.The band arrived as if shot out of a cannon, blasting through the first eleven songs in less than 30 minutes. Doing their best Ramones impression, the band rarely paused between songs and hardly acknowledged the near-capacity crowd before barreling into the next number. The songs were never rushed, but they were definitely urgent. Some of the best moments were the demented rockabilly of “Brick is Red” and the surf guitar intro to “Ana.” Guitarist Joey Santiago got plenty of time to play with feedback during “Vamos,” one of the few times the band deviated from the recorded arrangement. A medley of “Nimrod’s Son” and “Holiday Song” started with“Nimrod” at full speed before bouncing into “Holiday Song.” A slowed-down arrangement of “Nimrod” closed the medley. At 33 songs and 100 minutes, the band devoted plenty of time to exhume some deep cuts from its catalog, and deliver most of its biggest songs (including both versions of “Wave of Mutilation”). Francis let the crowd take over the choruses on “Where is My Mind?” and “Here Comes Your Man.” Given the band’s underground legacy, it was odd to see fists pumping in the air with every “chien” on the chorus of “Debaser,” but the quartet definitely knew how to work the theater crowd. The Pixies first reunion concert in Kansas City was a victory lap. The second concert was a celebration of their greatest album. This third visit was a view of the Pixies as a working band, trying to prove they still have plenty to say. They do. Setlist: Bone Machine; Wave of Mutilation; U-Mass &gt; Head On (Jesus and Mary Chain cover); What Goes Boom; Distance Equals Rate Times Time; Ilsa de Encanto; Monkey Gone to Heaven; Ana; Brick is Red; I’ve Been Tired; Magdalena; Cactus; Gouge Away; Bagboy; Blue Eyed Hext; Crackity Jones; unknown song; Veloria; Havalena; Snakes; Silver Snail; In Heaven (Lady in Radiator); Andro Queen, Indie Cindy; Greens and Blues; Where is My Mind? ; Here Comes Your Man; Vamos; Nimrod’s Son/Holiday Song (medley); Wave of Mutilation (UK Surf). Encore: Debaser; Planet of Sound.